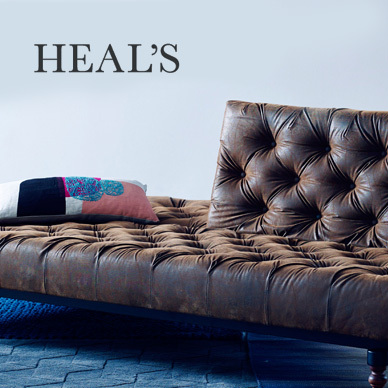 Heals has been providing designer and contemporary furniture, lighting and home accessories in London since 1810. Its philosophy of working with both established and talented young designers' has earned it a reputation as a purveyor of true design classics. Combining good quality, well-made furniture with cutting edge design, as well as iconic creations from designers such as Philippe Starck, Heals has created a collection of timeless, contemporary furniture for the discerning client. To complete the home interior, it also stocks home accessories, bed linen and gifts from a range of designer brands including Calligaris and Ligne Roset, providing the opportunity to find a true design classic whatever the budget. Add Heals to your Favourites list and be the first to know every time they have a Sale on! 1st January 2018 - Heals New Years Day sales for 2018. 7th May 2018 - Heals Early May Bank Holiday sales for 2018, add to your diary now! July 2018 - Heals Summer 2018 sales, joining us? 23rd November 2018 - Heals Black Friday sales in 2018 start on Friday 24th November. Add products from Heals to your Love Sales list. Get the Love Sales button now! Make Christmas magical with a little help from Heal's. For gifting inspiration, discover 'Presents for Particular People' with our Christmas gift guide, or make your home the perfect place to host family and friends by shopping our designer furniture, accessories and decorations. Make your guests feel right at home this festive season. To get your home Christmas ready, browse our living room, dining room and bedroom categories. Choose from our wide selection of luxurious items, including designer sofas, cushions, dinnerware and furniture. Heal's Mid Season Sale. Save up to 40% on Heal's furniture, sofas, lighting and homewares. Save up to 50% on designer furniture in the Heal's Sale. Browse our ranges for the living room, dining room and bedroom and luxurious sofas and armchairs as well as saving on top designer brands. Save up to 40% on designer furniture in the Heal's Sale. Browse our ranges for the living room, dining room and bedroom and luxurious sofas and armchairs as well as saving on top designer brands.